To get by in life, sometimes you simply have to know what to say. When it comes to enjoying your favorite spirits, there are so many words and expressions that it’s practically a whole other language. The 25 alcohol words you should know are broken down into basic ordering, dressing up a drink, and actually knowing what you are drinking. If you are in a bar and want to order a drink, you can come off as a sophisticate or a dunce. Knowing what to say when you are ordering a drink means you will get what you want and not sound like a dummy while doing so. Here are some of the most critical words to know for ordering. “Neat” means simply your alcohol of choice all by itself at room temperature – no mix or ice. “On the rocks” is your alcohol of choice over ice. “A cocktail” is a mixed drink that contains both alcohol and non-alcoholic mixers. “Straight up” is a method of serving either liquor or a cocktail, without ice. However, drinks served straight up are typically chilled first with ice and then strained while being poured into a glass. “A mist” is when straight alcohol is poured over crushed ice and served. “A chaser” is a drink that is typically a little more palatable than a shot of straight liquor and is used to help wash down the shot. It is usually a beer or a non-alcoholic drink. “Shooters” are strong little drinks served in shot glasses. Typically made up of a variety of alcohols, they can include non-alcoholic mixers too. “Shots” are pure alcohol served in shot glasses. A shot can be a serving of just one type of alcohol or it can be a mixture of more than one kind. Shots are meant to be gulped down in one, well, shot. “A sour” is usually a whiskey drink, but can be made with other types of liquor also. In addition to the alcohol of choice, a sour also contains sugar and lime juice or lemon juice to give it bitterness. “A tot” is simply a short shot. It can be found in a weak drink or a double that is not quite doubled. “Well drinks” are the less-expensive versions of spirits like rum, vodka, and whiskey that are kept in the well or speed rail of a bar and used to mix drinks unless a specific brand is ordered. “A toddy” is a drink that has been mixed with a base of hot water. Often a toddy is suggested as a remedy for many things. 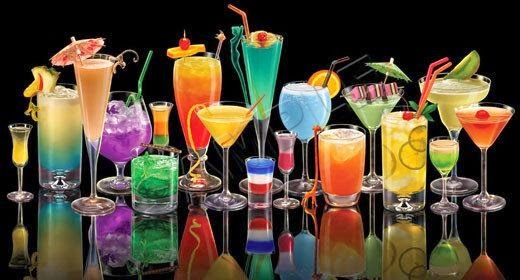 “A mixer” is any non-alcoholic beverage that is used to mix with alcohol in order to create a cocktail. “Perfect” is the term used for a drink that is made with both dry and sweet vermouth in equal amounts. There are so many ways to dress up a drink. In fact many cocktails have their own version of how a drink should be presented, with a fruit wedge, an olive, a cherry, an umbrella, or some other addition. However, you can also make your own adjustments to your favorite drink with simply a word or two if you know the right words to use. “Twist” – A twist is a little citrus peel that has been thinly sliced and twisted into a cocktail. The zest of the fruit releases oils into the drink to give it a brisk, light flavor. “Dirty” – A dirty drink, fun as it sounds, is typically just a term reserved for martinis and means that olive juice has been used in making the martini. “Virgin” – A virgin drink is one without alcohol. That doesn’t mean that every non-alcoholic beverage is virgin. We don’t talk about virgin milk or virgin juice. However, cocktails that are made without spirits are always referred to as virgin drinks. “Mocktail” – Mocktail is another term for a virgin drink. While knowing what you are ordering will keep you from sounding like a dummy, knowing what you are drinking will keep you out of trouble. Too often people find it embarrassing to let on that they don’t understand what is being offered. They simply say yes and indulge in the drink offered. Drinking blind like that can lead to trouble, so take the time to learn these important words. “Proof” is more than what’s in the pudding. Proof is about the amount of alcohol by volume. If you order 100 proof, you typically get 50% alcohol. Ordering a 151 proof alcohol is a lot more alcohol per shot, so beware. Also, if you are across the pond, know that the measuring system is different in the United Kingdom. Their 100-proof liquor is actually more than 114 proof in the U.S.
“Infusions” are popular variations on many spirits, which are made simply by letting fresh foods like vegetables, fruit, or herbs sit in the spirit of choice until that spirit takes on the flavor of the food. It is most often done with vodka, rum, tequila, and gin. “Whiskey” is a spirit typically made from fermented corn, wheat, rye, barley, and oats. It is aged for two years in oak barrels and is between 80 and 160 proof. “Bourbon” is a variation of whiskey that many people often confuse with whiskey. “Gin” is another fermented grain liquor that has added herbs and juniper berries for flavoring. “Vodka” is the most tasteless and clear of liquors, typically made from potato or grain. Because of its lack of flavor and scent, it is a good choice for infusions. “Liqueur or cordial” is a sweet spirit that is usually made from brandy, rum, or whiskey, and has different ingredients added such as seeds, nuts, spices, flowers, fruits, herbs, etc. With these 25 alcohol words under your belt, you can certainly pass for an alcohol sophisticate just about anywhere. No longer will you be embarrassed with a wrong order or a poorly chosen phrase to describe a drink that can be ordered with a word or two. Master these words and impress those you drink with!